If anyone’s keeping score on who the most credible and respected former Guns N’ Roses member is, it surely has to be Slash? While Axl descends further and further into madness with his appetite for destruction, Slash continues to make it look so easy. His self-titled debut album saw the top-hatted virtuoso call up some of his more famous mates for a jam or two. With a diverse variety of singers from Ozzy Osbourne to the Black Eyed Peas’ Fergie, his previous album showed Slash’s versatility and knack for writing tunes better than anything he’s been involved in since his stint in the early 90s era of the rock and roll legends. 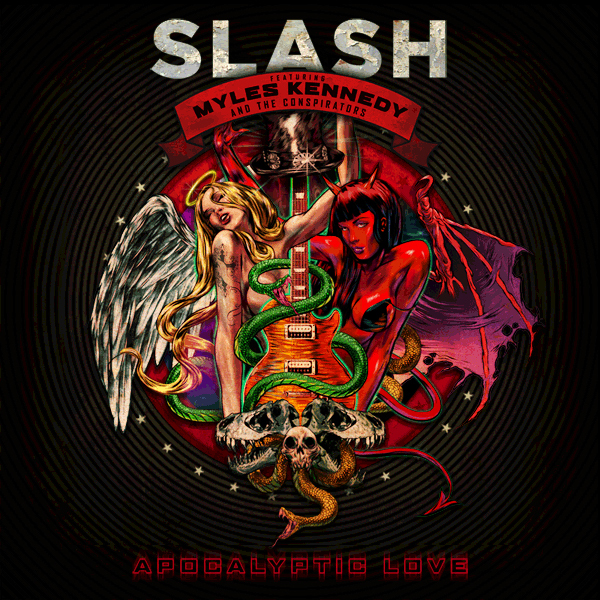 Since touring began on that record, Myles Kennedy of Alter Bridge fame has provided vocals for all of Slash’s songs, as well as various GnR and Velvet Revolver covers. 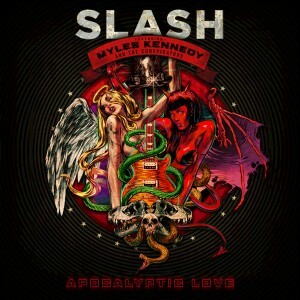 It’s not really surprising then that ‘Apocalyptic Love’ sees Kennedy taking lead vocal duties for every song, becoming a full-time and essential member of Slash’s band. It’s almost criminal to simply call this a Slash record. Its success lies equally with Kennedy. While the other members feel like session musicians, Kennedy’s swagger and downright amazing vocal ability is all over the 13 tracks. There are nods to other bands Slash has been a member of – ‘One Last Thrill’ sounding like it’s right out of Velvet Revolver’s catalogue thanks to Kennedy’s Scott Weiland-like rapid vocal delivery. But when it comes to standout track ‘No More Heroes’ Kennedy steals the show – that chorus, which you will remember after just one listen, is undeniably his. Then again, the lead guitarist of this ensemble is Slash, so there are self-indulgent treats all over the place. ‘Halo’ has one of the heavier riffs and is completely infectious, while ‘Far and Away’ harkens back to the likes of ‘Don’t Cry’ with its soothing clean tones. Of course, every song builds to a trademark bluesy solo during which you can almost see Slash standing on that clifftop outside the church. It’s hard to fault Slash’s ventures. He clearly sets a high standard for himself and those around him, and with a vocalist as talented as Myles Kennedy on board, he’s created a powerhouse rock ‘n’ roll outfit for the 21st century. Take notes, Axl. This is how one ages with grace.